The Book fair was a major success this year thanks to the amazing effort put in by Martine Schellenberg, who gathered sponsorship and donations from the community to run upmarket sandwich and sausage sizzle. The fair was smaller than usual but had the sandwich bar, a book stall, cooking raffle, miscellaneous – baking, new books and jewellery. The Cooking raffle had two prizes this year. The major one had several great prizes which included a dinner voucher from the Piha Café, donations from the Warehouse Westgate, a cooking lesson by Claire Inwood, and donated items from library members, including some excellent wines. The books for sale included donated books from the community, Auckland Libraries and withdrawn Piha Library books. The Piha Community Library Mural project was the brainchild of local artist Shelley France. Originally seeking to undertake the mural in a series of weekend workshops it ended being a yearlong project for Shelley assisted by her partner Peter. A wonderful outcome for the Library building. Sponsored by Creative New Zealand and completed with funds from the Waitakere Local Board the project grew and grew. Children and their parents signed up to paint their favourite books characters at our annual book sale and then Shelley lead them through them through the many levels of design which were necessary to produce the finished product. New Zealand characters from picture books, graphic novels and junior fiction completed the X of characters which now adorn the mural background painted by Shelley and local Tine Gorter. A list of the children who contributed is on the window of the library. The celebration of the opening of the mural was aided by stories from local historian Pita Turei. Everyone was welcomed by Library Trustee Glenda Northey and then Shelley and the children officially pulled the ribbons to reveal their work. Local politicians attended and enjoyed the positive vibe from the event and the amazing work by the children and Shelley. Also attending were west Auckland councillors Penny Hulse and Linda Cooper and the new National candidate for Helensville Chris Penk. A great day for the library. CWF Festival 2017 - Tales of the Waitakeres. The 2017 Creative Writers Festival was held on a cold wet Sunday at the Bowling Club. Unfortunately competing with the All Blacks game meant that numbers were half the usual turnout. Not deterred we competed against the noise of the driving rain and enjoyed an afternoon of discovery. The calibre of four speakers was outstanding and for the next two hours they took the audience through local Maori history and archaeology, the creation of Auckland’s dams in the Waitakere Ranges, local pest control outcome in a block at Karekare, and an explanation of the sand movement from Mt Taranaki up the coast to Piha. Each speaker spent about half an hour on their area of expertise and united the audience in their passion for their subject area. Local Mark Mitchinson was MC for the event and tied the stories together well. The speakers were archaeologist Lisa Mckendry who came all the way from Tauranga to talk about her research on Maori flax fibres cloaks (kakahu), bags (kite) and ropes made from harakeke found in the Piha and Karekare area. Lisa is a weaver herself so she provided some fine examples of the types of cloaks and weaving of the era. Lisa completed her MA on the topic. Harvey Stewart was an engineer at Watercare and was instrumental in setting up the Rainforest express which took hundreds of people through the tunnels and long the tracks made in the late 1800s. These tracks and trains originally provided the workers on the dam with all their cement and wood for the massive dams which now provide Auckland with water. Photographs of those who worked in the wet conditions mixing concrete by hand to construct the massive dams brought the story to life. A large community spent years in the bush, with their families attending school, playing tennis and supporting the men who worked. Peter King spoke passionately about the effects of pest control in the 200 acre block at Karekare called the La Trobe Forest Restoration Project which has seen a huge drop in the number of possums and rodents and a consequential increase in bird life in the area. Peter provided some lovely photos of the local kereru living near his house. We were treated to a lesson on kereru mating habits. Dr. Terry Hulme, a longtime surfer at Piha, and marine geologist/coastal oceanographer described the effects of the sand movement up the coast on local surf breaks and the process of the sand build up in areas like Karekare and Piha. His photographs showed the changes in the shoreline from the Manukau Heads. He described the area at the mouth of the harbour as a huge sandpit. Keeping away from the controversy of the impact of man-made structures effecting the shoreline he talked about his love of Piha surfing. Children dressed in wonderful costumes arrived at the library on Saturday 29th October to have their faces painted and to make colourful Halloween goodie bags for trick or treat night. Parent and children all enjoyed the crafts and went away with wonderful scary faces and some lollies to start their goodie bag collection for Halloween night. On June 8th the Piha Community Trust hosted a Readers and Writers Festival about how the west was won. This event was sponsored by the Waitakere Ranges Local Board. Authors Bruce Haywood, Bob Harvey and Sandra Coney gave interesting accounts of their areas of interest. The depth of their knowledge made the event very special. Bruce Haywood talked about his work with JT Diamond and the mapping of Maori middens and pa sites throughout the ranges around Piha, Anawhata and Karekare. He then went on the to discuss the geology of the area and basically how the west coast, as we know it, was made. Then Bob Harvey and Sandra Coney discussed their time at Piha and how they became interested in writing up the history of the area. Many interesting antidotes were shared with the crowd of over 60 people who attended the Bowling Club event. Local Helen Dudder’s quartet played in the breaks and provided the right kind of ambience to the event. The Bowling Club created a great atmosphere to run the event and we hope to do it again there next year. The Festival was the second major fundraiser run by the library to build up funds to cover their administration costs, such as telephone and internet. The 2016 Anniversary Day Book sale a great success and all books sold for a $1. Aided by face painters Robyn and April the children lined up for some magnificent painting while their parents sought a pile of books to take home. Maureen, Clive and Martin were on the BBQ while Jill, Jean, Ann, Marilyn, Alberto and many others helped on the book tables. The Halloween workshop was a great success and because Halloween was the day of the workshop we got a huge number of children dressed in costumes participating. Kids of all ages who made a variety of Halloween paraphernalia, we had a bat piñata donated for the children, and the lolly scramble was also a great hit afterwards. The library distributed some homemade Halloween cookies to those who attended, made by Glenda and Maureen. The car boot sale organised by Fiona Anderson at the campground, in support of the library brought in some much needed funds and the library had a stall selling off some more of the withdrawn and donated books from the library. A special thanks to Alberto Bonini, Maureen and Clive Thompson who always come and help on the library stalls. About 20 children joined us at the library for our pre-Halloween day. Some came in amazing costumes and others just came to enjoy some respite from the wet weather and to make some crafts. Shelley and Glenda had set up four different activities and children moved between the tables making mask, bats, witches and colouring in. Lots of sparkles and stars added to the crafts produced. Most popular were the masks, which - spurred on by some examples brought by Shelley - the children turned into some crazy monster masks. Each child was given a gingerbread Halloween biscuit for attending (sorry about the black mouths). A great day and a well behaved crowd of local and visiting youngsters. We were extremely lucky to have talented best-selling author Stacy Gregg visit our library during the July School holidays. Stacy spoke about her writing, and read from her latest award winning book, The Princess and the Foal. She also gave us some inside information about her upcoming book, Island of Lost Horses, which will be released in November. The young readers and riders of Piha were mesmerised while Stacy spoke, and had lots of questions to ask her about horses, writing and meeting the Princess Haya Bint Al Hussein of Jordan. A big thank you to Shelley France for organising a fantastic Easter card making session. The children (and some of the adults too!) had a wonderful time. The Car Boot sale was held on Easter Saturday in the Piha Domain. As well as lots of fantastic treasures for sale there was a sausage sizzle and cake and baking stall. Loads of fun was had by all, and there were many requests to make this a regular event. Another wonderful community event. Thanks to everyone who helped make this a successful fundraiser for the library! On the Eve of Christmas Eve we had a Christmas Activity Hour at the Piha Library. There was a Christmas themed story time, singalong, and craft session. Thanks so much to the fantastic Ann Russell for running this activity session for us. The children loved making a special decoration to take home and hang on their tree. Our thanks go to the fabulous Stephanie Tong for the awesome weaving workshop that she did with some of our younger members over the October School Holidays. Stephanie helped the kids make beautiful treasure baskets, and then took them on a treasure hunt to find amazing things from nature to put in them. The kids worked really hard and achieved beautiful results. Stephanie also held a workshop for adults at the Library on Sunday 27th October. Contact Steph to find out more about upcoming workshops. During the school holidays we asked our junior members to create a Monster, and enter the draw to win a book prize. One prize for each category (Under 6 years, and 6 years +). The response was awesome, thanks so much to all our fantastic young artists. The gorgeous creations are on display in the library for the next couple of weeks. Congratulations to our two winners, Cassidy Foster in the under 6 category, and Jayden Reader in the over 6 category. Thanks very much to local artist Beck Wheeler for making the tough decision of which of these amazing creations were to be the prize winners! Piha Library once again took part in the awesome Storylines Festival of New Zealand Children's Writers and Illustrators. Graphic Novel Superstar Dylan Horrocks visited the library, and gave the children advice on coming up with ideas, telling stories with pictures, plus some very practical advice on drawing. He encouraged some very talented young budding Comic writers to have fun and let their imaginations run wild. His advice: remember to always doodle in your schoolbooks when you're in a boring class, and don't forget to daydream! In the second of two festival events we welcomed widely published Maori Poet Robert Sullivan and Award-winning screenplay Writer and Director Stephen Sinclair to the Piha Surf Life Saving Club. It was yet again a family affair, with our own two-times AFTA award-winning Mark Mitchinson as MC, and respected current affairs and political journalist and local Rachel Smalley interviewing. This was another fascinating and entertaining event, thoroughly enjoyed by those who attended. For those who were unable to attend the library will be holding another fabulous Readers and Writers Festival next winter! Let us know if you'd like to get involved. "Melu" - Kyle Mewburn's hilarious tale about a donkey unlike any other - won the Children's Choice award at this year's NZ Children's Book Awards. 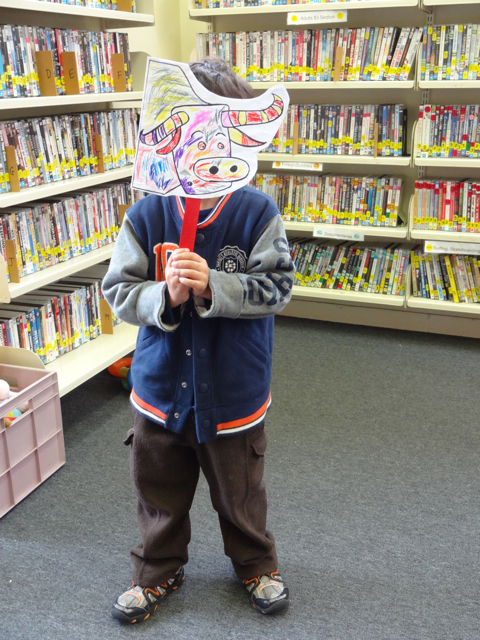 Children listened to the story, created their own themed masks, and had the opportunity to take part in a short Melu themed play. Lots of fun! This is the third year of our annual Readers and Writers Festival fundraiser at the Piha Surf Life Saving Club and the events just keep getting better! This year in the first of two festival events local icon Bob Harvey interviewed acclaimed New Zealand novelist and poet C.K. Stead and celebrated comic screenplay writer and newspaper columnist James Griffin. The afternoon was once again a huge success, and lots of fun. Our children's activity during the School Holidays gave our Junior members the opportunity to do some hands-on, and awe-inspiring, scientific experiments. Laura Harvey, a secondary school science teacher, kindly agreed to show our Junior Members a really fun and fascinating way to test the acidic or alkaline properties of household products. The children were amazed to learn about the properites of dry ice, and to see it in action. Thanks so much Laura for taking the time to show our Junior members how exciting science is! National Primary Science Week is being held on 20th-24th of May. Find out more about Science activities taking place around Auckland during this time. Over the summer holidays local children worked with fabulous Piha-based artist Beck Wheeler to create a mural that has been mounted in the Children's area of the library. The children's paintings were inspired by the imaginative artwork of Beck Wheeler's own picture book, "How Absurd", where a young girl takes the world's animals and mixes them together, creating her own new and absurd animals. The message the books leaves us with is this: "Imagine, we could put the world in a whizz... or leave it exactly the way it is". The crazy, mixed up animals that the children painted are a reminder for them (and us) of the power of the imagination. On Saturday 20th April the mural was opened to the public. The library was buzzing with many members of the community coming along to see the amazing work of our upcoming young artists, and original panels by Beck herself. The library would like to acknowledge and thank Beck Wheeler for the enormous amount of volunteer hours and energy and ideas that she generously gave to enrich the Children's area of the library. What an outstanding effort- we really appreciate it. Beck's book "How Absurd" is available for sale at the library and original works are available at the West Coast Gallery. Beck has her own website, www.kissykissykids.com, where you can view and purchase her amazing art for children. There was a wonderful turn out at this fabulous annual Library Fundraiser. There were new and second-hand Books, DVDs and Magazines for sale, and fabulous raffle prizes up for grabs. There was also face-painting for the children, an organic free-range sausage sizzle, with drinks and delicious real berry ice cream for sale. This was a wonderful community event. Thank you to everyone who supported this Piha Library fundraiser. A group of 20 children from our community worked with local artist Beck Wheeler to create awesome "Absurd Animal" creations which will be part of a mural mounted in the Junior area of the library. What an amazing day! Many thanks to Beck and Chris for giving their time and expertise, and to all the members of our community who helped out. Stories, songs and Puppy Finger Puppet activity with local Children's Author Ann Russell, author of "Little Truff". On Saturday 25th August Children's Writer Tessa Duder visited the Piha Community Library as part of the 2012 Storylines Festival of New Zealand Authors and Illustrators. In January 2012 we held our inaugural Book Fair Fundraiser on the deck of the library. This fundraising event was a huge success and we have decided to hold another one next January. We hope to see you there.